Want to project a polished image for your next party? 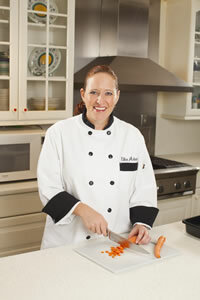 I am Chef Ellen Adams and I specialize in cooking complete menus for dinner parties, birthdays, and many other special occasions. I take the hassle out of hosting a dinner party by cooking for the event right in your kitchen! My goal is to impress your guests with my food and to allow the host and/or hostess to enjoy their friends without having to worry about the menu. I have experience preparing multi-course meals for as few as 2 people or as many as 20. Whether your party is a romantic dinner for two, sit down dinner for 12 or a buffet for 20, I can make a meal your guests will love! I also teach group and private cooking lessons. I am happy to come to your kitchen or you can come to mine. I spent 3 months in Italy attending the Italian Culinary Institute for Foreigners and completed an internship at the Villa Serbelloni on Lake Como in Bellagio, Italy. I learned to prepare fresh pasta, saltimbocca, gnocchi, risotto and tiramisu...plus many other Italian specialties! 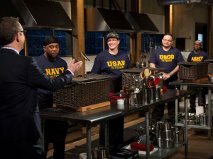 Chef Ellen competed on Food Network's "Chopped". Need the perfect gift? How about a Cooking Lesson Gift Certificate!